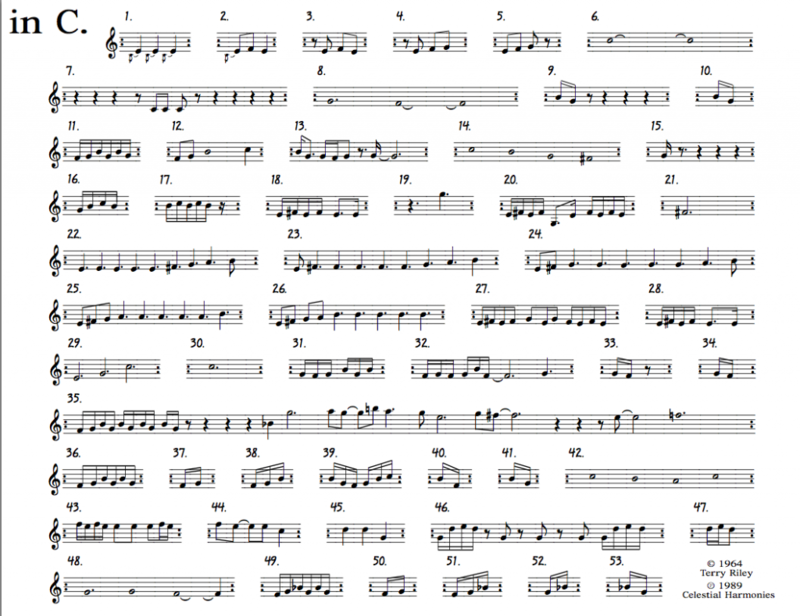 The next in the series of Hidden Music data sonification works. Data sonification is a long term interest/project/passion of mine, which involves the systematic translation of ‘non-musical’ data into music. Here I’ve taken Kandinsky’s beautiful 1926 painting Several Circles and translated it systematically into sound. Colour and vertical position are translated into timbre and pitch respectively, as the red cursor scans the image horizontally. Thanks as ever to Anna Tanczos for the visuals. Here’s the first in a long series of data sonification experiments. 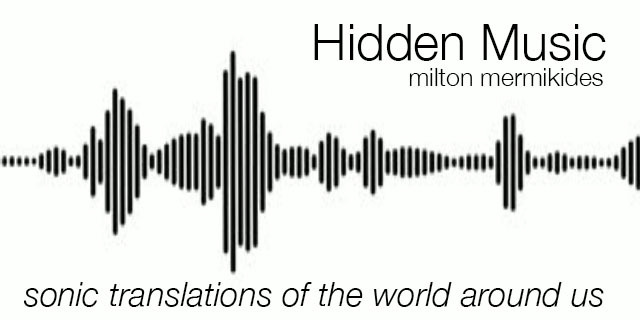 This Hidden Music series is a long term interest/project/passion of mine, which involves the systematic translation of ‘non-musical’ data into music. Here’s a simple example, the orbital periods of the planets of the solar system translated into pitch and rhythm. The rhythms are simply created by speeding up the actual orbital periods by 25 octaves (doubling the speed 25 times), and the pitches are created by transposing them up 37 octaves. I haven’t quantized pitch or rhythm, so its both microtonal to the nearest cent (100th of a semitone) and microtemporal (to the nearest millisecond), but I hear a clockwork beauty in this irrational/chaotic collection of ratios nonetheless. Stay tuned for some even more distant harmony from some ex-planets. I recommend a sub-bass speaker to really feel Uranus and Neptune’s drones. Thanks to Rob Scott for his space science brain, and my long term partner-in-nerd Anna Tanczos for the visuals. 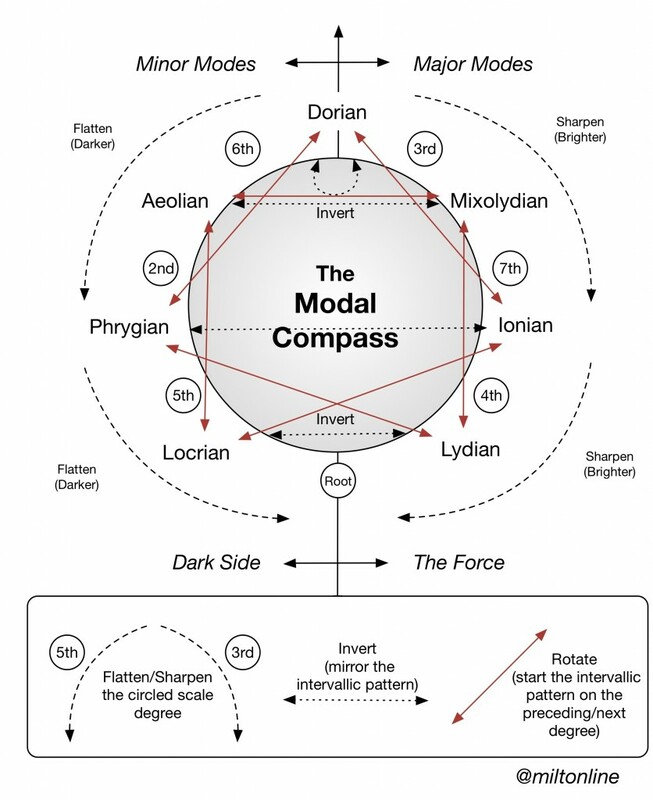 A way of visualising the relationship between the modes of the major scale. When I have time I’ll expand to other modal groups (and fix the dodgy alignments). Here’s some info for my Hidden Music exhibition 7-13 May 2015 at the Lewis Elton Gallery. A series of works created through translation of natural phenomena into sound. I asked my friend and many-time collaborator Anna Tanczos to visualise Villa-Lobos’s New York Skyline Melody for a recent lecture-presentation. The results are fantastic (I predict 1000s of views), and you can see exactly how Villa-Lobos translated the New York Skyline into a solo piano work (note the multiple voices with the foreground and background buildings). This piece has been a big inspiration to me the field of data sonification. For more on New York Skyline Melody and similar works see here, and for all things Data Sonification here. Digital animator (with a PhD in Chemistry) Anna Tanczos has set my composition ‘The Escher Café’ to video for live performances. Here’s an extract with animated tessellating lizards no less. Martino Unstrung (2008 Sixteen Films) – for which I was honoured to compose the music – is now available to view online. In 1980 Pat Martino moved his belongings from California to Philadelphia to live with two complete strangers: his parents. As a young jazz guitar virtuoso he had achieved near legendary status during the 60s and 70s, before being diagnosed with a life-threatening brain condition. Surgery had saved his life but wiped his memory. Back in his childhood home, surrounded by the relics of his former life, his father played him his old recordings at full volume and friends rallied to try to coax him back to being the great artist he had been. He could not dispute the evidence; the face in the mirror was the same as the one on the record sleeves but it meant nothing to him. Amnesia had ripped selfhood from his brain and rendered his life meaningless. He was nobody. Director Ian Knox and Neuropsycologist Paul Broks travel America in search of the soul of the legendary jazz guitar great Pat Martino, tracing his remarkable return from the depths of amnesia to the peak of artistic achievement. FEATURING: CARLOS SANTANA, PETE TOWNSHEND, LES PAUL, JOE PESCI, JOHN PATITUCCI, RED HOLLOWAY, DELMAR BROWN. Here’s details of a public seminar on Wednesday 29th October 4pm, TB06, University of Surrey. Digital music technology has now fulfilled Varèse’s dream of “instruments obedient to […] thought”, Russolo’s call to “conquer the infinite variety of noise-sounds” and Busoni’s desire to “draw a little nearer to infinitude”. However, the staggering developments in music technology over the last 20 years has brought with it a less predictable outcome, the ability to better understand the mechanics of music itself, and to illuminate some of the mysteries of its expressive power. Through a survey of recent research projects, this seminar examines how our understanding of musical expression in pitch, rhythm and timbre can be enhanced with technological support, furthering analytical insight, artistic appreciation and creative practice. The fabulous Qed conference happened again this year, to much acclaim. Very happy to work on the intro video again. (Here’s 2013‘s offering). This time Paul Zenon revealed his superstitions. Many of these are particularly inside jokes in the skeptic community, but I hope others are entertained. Fingers crossed. Bridget and I will be performing at 1.30pm Sunday March 30th (University of Surrey) at the launch of the International Guitar Research Centre (IGRC) run by Steve Goss and me. 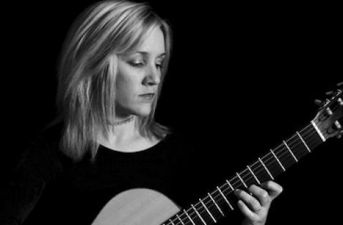 We’ll be performing 7 new works for classical guitar and electronics. Not the usual guitar rep. Tickets are £2 for students and £10 for the rest of us. Would be lovely to have some friends (of ours and new music) there. The Times Higher Education have run a well-written feature on the Bloodlines project. Transplant inspires siblings’ Bloodlines project | News | Times Higher Education. Delighted to learn that the film version of Bloodlines will be featured in the Fabrica Vitae touring exhibition. 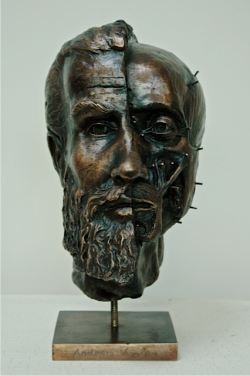 Fabrica Vitae is inspired by Andreas Vesalius (1514-1564) and explores art and anatomy through the work of contemporary artists, scientists and thinkers. It will feature work from artists and scientists who are working together to re-imagine and extend the understanding of the human body. More details will be available after Feb. 27th on www.fabrica-vitae.com. The first Fabrica Vitae exhibition will take place in Zakynthos, Greece in May 2014. Dr. Simon Park (my serial bio-art collaborator (like this) and creator of the amazing exploring the invisible site along with sound guru Professor Tony Myatt and I, have been exploring the interaction of sound/music and the Pyrocystis fusiformis bioluminescent algae. As you do. Here’s a sneaky pilot. The Colour of Sound: Whale Song | Exploring The Invisible. UPDATE- Since the publication of Brad Osborn’s Kid Algebra (2014), I’m going to switch to his category of Euclidean rhythms (in their 4 types) to describe the patterns below. In summary, Euclidean rhythms (ER) are rhythms in which k onsets in n divisions are as similar as possible, which essentially means that they will only differ by at most one subdivision each. So in ER the groups are as similar as possible, but the term maximally even we will reserve for ER rhythms where the smaller note groups are as separated as much as possible. For example, (2,2,3,3) and (2,3,2,3) are both ER, but only the latter is maximally even. 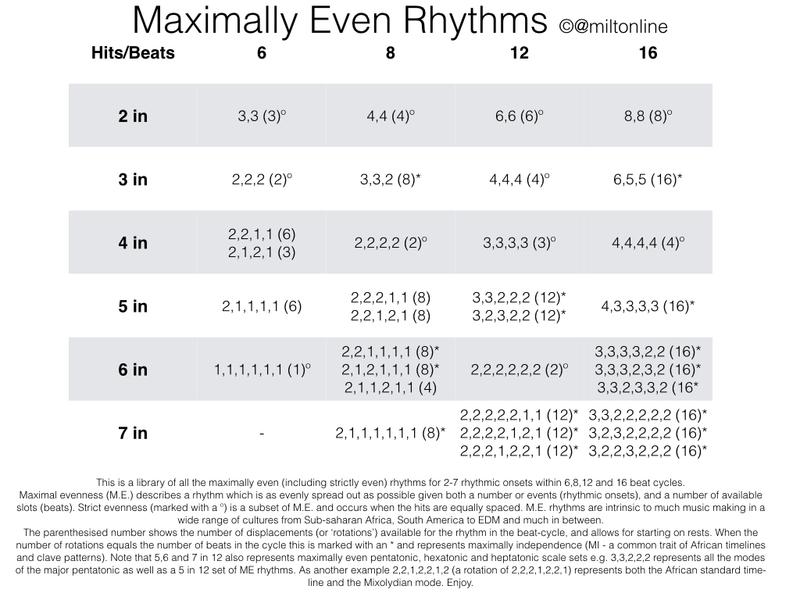 This is a library of all the maximally even (including strictly even) rhythms for 2-7 rhythmic onsets within 6,8,12 and 16 beat cycles. Maximal evenness (M.E.) describes a rhythm which is as evenly spread out as possible given both a number or events (rhythmic onsets), and a number of available slots (beats). Strict evenness (marked with a º) is a subset of M.E. and occurs when the hits are equally spaced. M.E. rhythms are intrinsic to much music making in a wide range of cultures from Sub-saharan Africa, South America to EDM and much in between. The parenthesised number shows the number of displacements (or ‘rotations’) available for the rhythm in the beat-cycle, and allows for starting on rests. When the number of rotations equals the number of beats in the cycle this is marked with an * and represents maximally independence (MI – a common trait of African timelines and clave patterns). Note that 5,6 and 7 in 12 also represents maximally even pentatonic, hexatonic and heptatonic scale sets e.g. 3,3,2,2,2 represents all the modes of the major pentatonic as well as a 5 in 12 set of ME rhythms. As another example 2,2,1,2,2,1,2 (a rotation of 2,2,2,1,2,2,1) represents both the African standard time-line and the Mixolydian mode. Enjoy. 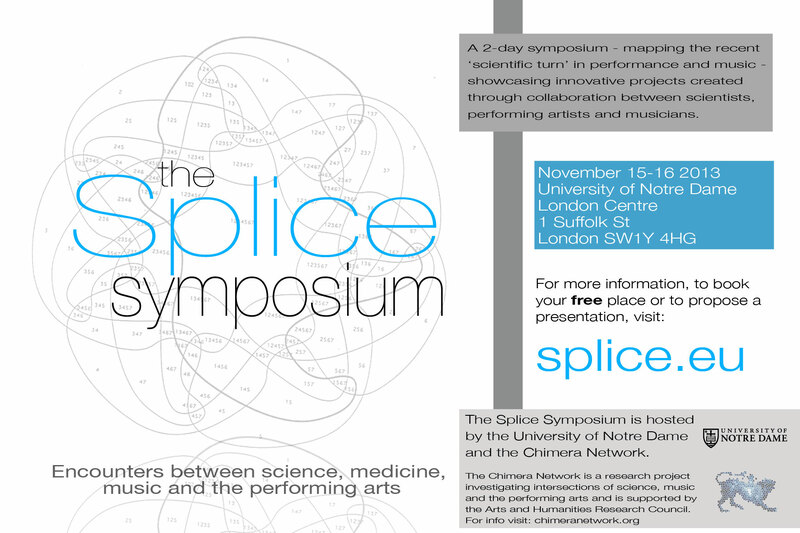 Announcing a 2-day symposium (November 15-16 2013 at University of Notre Dame in Central London) examining the process, philosophy and products of collaborations between scientists, musicians and performing artists. It’s hosted and organised by me and my sister Dr. Alex Mermikides, and is an output of the Chimera Network – and AHRC-supported project promoting Art/Sci research. I have been thinking about ‘nutshell’ images for a range of musical concepts. 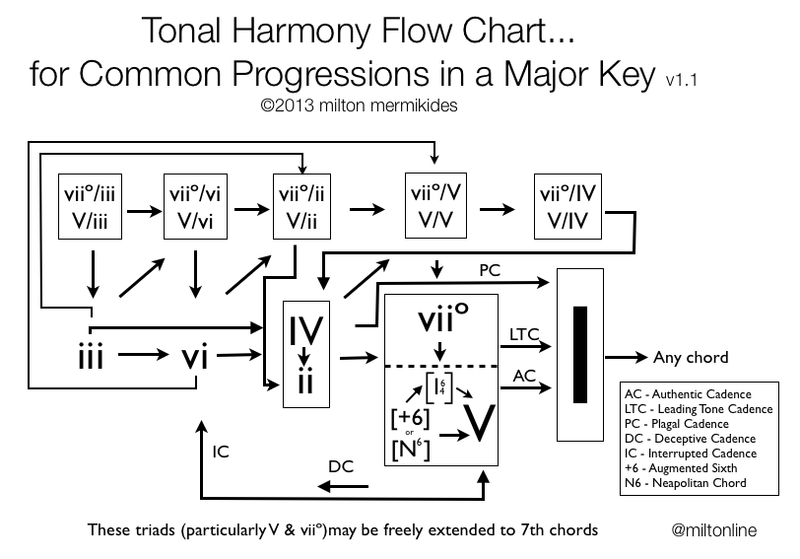 Here’s a work in progress on common progressions in a major key in 17-19th century tonal harmony. Yes caveat, WIP etc, but it seems quite useful. Comments and suggestions welcome! Minor key next, please don’t let me turn them into 3D models for mode mixtures and modulations. Bloodlines is a performance that traces the microscopic drama that plays out between a serious disease and medical treatment in the human body. It draws on its makers’ personal experience of Acute Lymphoblastic Leukaemia (which I developed in 2004) and its treatment through intensive chemotherapy, radiotherapy and a bone marrow transplant (donated by his sister Alex Mermikides, who is directing the performance). Also collaborating in the performance is Ann Van de Velde, a clinical haematologist involved in the care and treatment of blood disorders such as Leukaemia, and Anna Tanczos, a digital artist specialising in science communication. 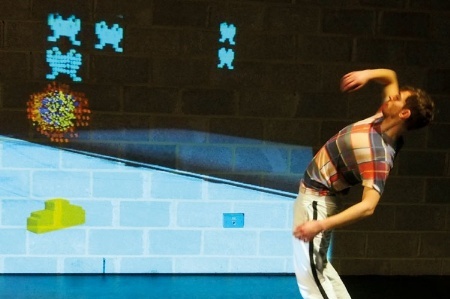 Bloodlines premiered at the Dana Centre on 18 July 2013. Future performances will be announced on the Events page. Here’s a bootleg from the first performance. On the 14th October 2013, I’ll be joining the eminent musician and fellow Wodehouse character Peter Gregson at the Luton Music Club to max out on Minimalism. Details to follow, but on the programme is Terry Riley’s seminal work In C in all its heterophonic and generative gorgeousness. Rather than play it (on my guitar) traditionally with the ensemble, I thought it fun (and more interesting) to use Ableton Live (and Push) to rebuild it so it ran generatively. I’ve done a very simple version which adopt most of the instructions, any errors kindly forgive me and my future generations. And here’s the WIP for your to download in the spirit of musical democracy. Hit scene 1 and they’ll tumble through, I’ve weighted the follow actions to have on average more repeats on shorter phrases which makes sense musically. You can intervene, urging on any stragglers and holding back any clips forging too far ahead. Actually I may need to consult a statistician as the deviation in fall rates seems (in my fallible intuition) to suggest something’s a bit skewy with the randomising process. But oh well, the variation in performances is intriguing (I’m on listen number 6 and still very happy). You can of course ride volumes, edit instruments and send out effects to your ears’ content. You can always set clip 53 to – rather than stop – return to clip 1 so the piece lasts forever, with clips lapping each other – adding another dimension to the work. If Follow Actions in Live were more sophisticated or I had time to render in Max the clips could behave more intelligently by grouping together, dropping out and changing velocity more responsively as per score instructions, but it actually works quite beautifully as is, which is a testament to the power of Riley’s concept. 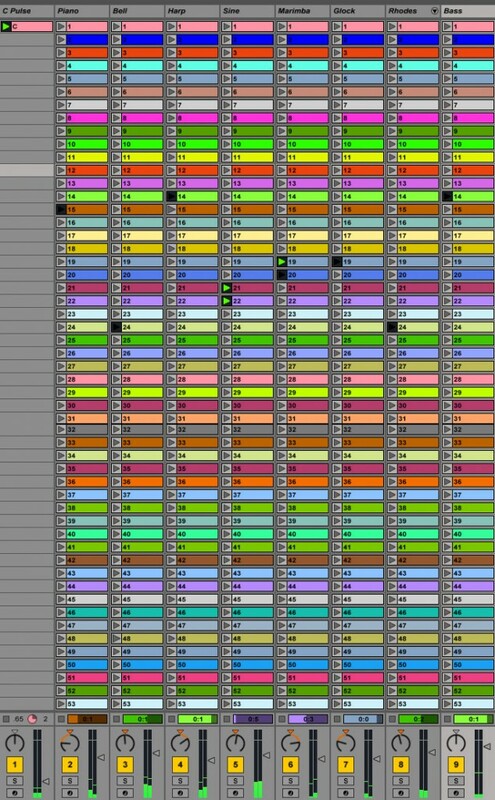 Thanks to user Jeepee on the Ableton forum, whose patch I discovered when googling this idea, I’ve kept many of Jeepee’s clips as I like how he/she played them, but am also thinking of doing it PROPERLY in Max and crowdsourcing midi and audio clips from the interwebs when the Earth slows and there’s enough hours in the day for such mischief.